An ordinance and bill in Rajasthan threatens India’s free press and highlights worrying trends. It is only sometimes that a clampdown on free speech in the interests of protecting the corrupt can be fought against effectively. Usually, this reasserts a need for a strategic public outcry toward any such attempts at crushing the spirit of democracy. On October 23, the Bharatiya Janta Party-led government of the western Indian state of Rajasthan tabled the Criminal Laws (Rajasthan Amendment) Bill in the state Legislative Assembly, seeking to protect serving and former judges, magistrates, and public servants from being investigated for on-duty actions and prosecution. Furthermore, the bill sought to bar the media from reporting on allegations against them without the government’s prior sanction. Swiftly, a bevy of people from the state’s civil society, including lawyers and journalists, voiced their opposition to the bill, which led to it being pushed to the Selection Committee, where it is assumed that it will be a while before it is deliberated upon. Pushback also came from the Indian National Congress, which is the opposition party in Rajasthan. An ordinance was promulgated on September 7, which was replaced in the Assembly by the Criminal Laws (Rajasthan Amendment) Bill, 2017. A petition before the Jaipur bench of the Rajasthan High Court challenged the ordinance, deeming it “arbitrary and mala fide” and that it was “in contravention of fundamental rights as enshrined in the Constitution of India.” Of course, the ordinance and bill haven’t clarified issues regarding enforcement in situations when the media is outside the jurisdiction of Rajasthan. Two Union ministers defended the bill, stating that it would prevent motivated complaints that could harass honest officers and judges, while Sachin Pilot, president of the opposition Congress party in Rajasthan, was detained by the police during a protest march. Senior journalist Karan Thapar wrote that “this Ordinance ensures that judges, magistrates and public servants are treated differently to you and me if they are accused of corruption or any other criminal act,” which violates the constitutional decree of everyone being equal before the law. 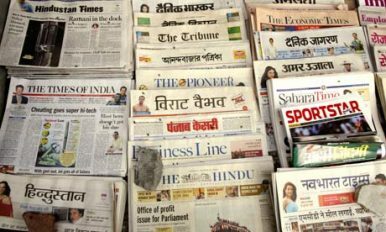 The Editors Guild of India issued a statement condemning the bill on the grounds that it could serve as an instrument to harass journalists for bringing to light important issues of corruption and public interest. While the ordinance and the bill have caught everyone off guard – including some from within the BJP – it comes as no surprise that this is a strategic move with the election in sight in 2018, when unraveling scams and scandals become the bedrock of the campaign season. The Rajasthan government, headed by Vasundhara Raje Scindia as the Chief Minister, claims that 73 percent of the public servants across various offices who were probed, were found to be not guilty and were unnecessarily harassed. Even as these numbers are yet to be verified, the legacy of Raje Scindia has to be considered in context: born into a royal family and with a mother for a politician, Raje Scindia has been in politics since 1985. In 1998, she was appointed the minister of state for external affairs. She was the chief minister of Rajasthan from 2003 to 2008, and came to power again in 2013. That same year, she was embroiled in a controversy: a public interest litigation alleged that millions had been transferred into a company owned by her son and herself, using a shell company. Her predecessor of the Congress Party had granted a mining lease to a company that was considered close to the party, and the BJP had heavily criticized the move. But Raje Scindia chose to not cancel the lease when she came to power in 2013, thus making BJP’s concern about corruption questionable. She is also widely known to have granted favors to Indian businessman and brain behind India’s first cricket league Lalit Modi, who was accused of financial misconduct in a much-publicized investigation. Clearly, the bill is an attempt to stymie any kind of rustle, and thus secure the position of Raje Scindia and the BJP for another five years. But this is not the first time such a tactic has been employed prior to an election. Nearly two decades ago, Prime Minister Rajiv Gandhi of the Congress introduced a defamation bill in the Parliament, which stipulated that editors and proprietors of newspapers could be sent to jail if they were guilty of publishing “scurrilous material” or “criminal imputation.” Protests across the country by journalists led to withdrawal of the bill. With the clear message toward preferring a shroud over wrongdoings and a clog in the job of journalists and whistle-blowers, Raje Scindia’s government may have attempted to save face before the mud-slinging, typical of election season. However, with the bill now gone into the policy graveyard of the Selection Committee, it is imperative that the citizens of Rajasthan remember this strategic maneuver in the game of votes.